I am always on the lookout for delicious cocktails, particularly delicious bourbon cocktails, and especially delicious bourbon cocktails that are easy to make. I found the recipe for this one, which meets all my criteria, in Michael Dietsch’s “Cocktail 101” column on the blog Serious Eats. There are several cocktails called “Derby” cocktails, I suppose because of the connection between drinking and betting on the ponies. 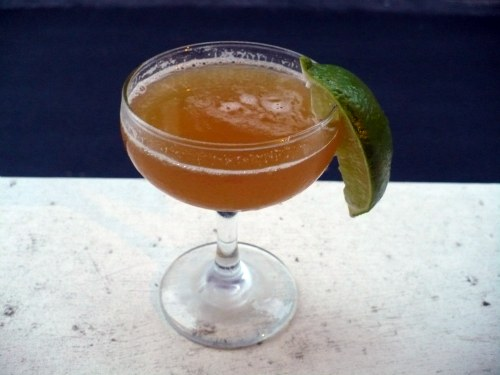 (That would exclude the Brown Derby, which is named for the Brown Derby restaurant chain in Los Angeles and is made with bourbon, grapefruit juice and honey.) The most famous cocktail associated with the Kentucky Derby is, of course, the mint julep. But I think most juleps are far too sweet and much prefer this Derby, which is a sour cocktail by virtue of the lime juice. I second that. Here is the recipe. Fill a cocktail shaker with ice. Add bourbon, lime, sweet vermouth, and Grand Marnier (or other orange-flavored liqueur equivalent) and shake well. Strain into a chilled cocktail glass. Garnish with lime wedge or mint leaf. And you’re off!